Did Hedge Funds Drop The Ball On ING Groep N.V. (ING)? As we already know from media reports and hedge fund investor letters, many hedge funds lost money in fourth quarter, blaming macroeconomic conditions and unpredictable events that hit several sectors, with technology among them. Nevertheless, most investors decided to stick to their bullish theses and their long-term focus allows us to profit from the recent declines. 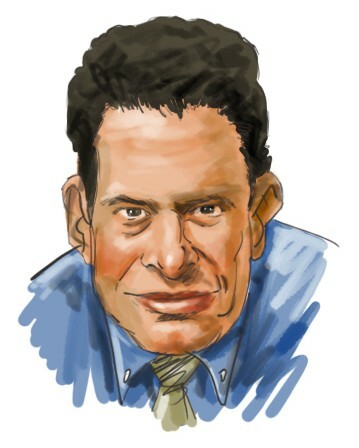 In particular, let’s take a look at what hedge funds think about ING Groep N.V. (NYSE:ING) in this article. ING Groep N.V. (NYSE:ING) was in 7 hedge funds’ portfolios at the end of December. ING investors should pay attention to a decrease in support from the world’s most elite money managers of late. There were 8 hedge funds in our database with ING holdings at the end of the previous quarter. Our calculations also showed that ING isn’t among the 30 most popular stocks among hedge funds. Let’s take a look at the key hedge fund action encompassing ING Groep N.V. (NYSE:ING). What does the smart money think about ING Groep N.V. (NYSE:ING)? Heading into the first quarter of 2019, a total of 7 of the hedge funds tracked by Insider Monkey were long this stock, a change of -13% from one quarter earlier. 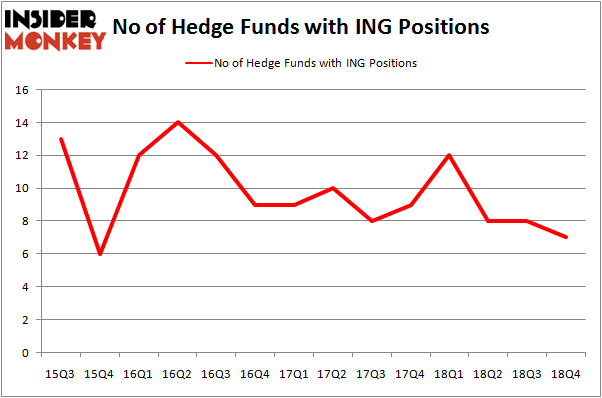 The graph below displays the number of hedge funds with bullish position in ING over the last 14 quarters. With the smart money’s sentiment swirling, there exists an “upper tier” of noteworthy hedge fund managers who were increasing their stakes meaningfully (or already accumulated large positions). Among these funds, Fisher Asset Management held the most valuable stake in ING Groep N.V. (NYSE:ING), which was worth $472.1 million at the end of the third quarter. On the second spot was Renaissance Technologies which amassed $27.9 million worth of shares. Moreover, PEAK6 Capital Management, Weld Capital Management, and Citadel Investment Group were also bullish on ING Groep N.V. (NYSE:ING), allocating a large percentage of their portfolios to this stock. Due to the fact that ING Groep N.V. (NYSE:ING) has faced falling interest from the entirety of the hedge funds we track, logic holds that there exists a select few hedge funds that slashed their positions entirely last quarter. It’s worth mentioning that Peter Rathjens, Bruce Clarke and John Campbell’s Arrowstreet Capital dumped the biggest position of the 700 funds monitored by Insider Monkey, comprising an estimated $12.6 million in stock. Ken Griffin’s fund, Citadel Investment Group, also cut its stock, about $0.3 million worth. These bearish behaviors are intriguing to say the least, as total hedge fund interest fell by 1 funds last quarter. Let’s now take a look at hedge fund activity in other stocks – not necessarily in the same industry as ING Groep N.V. (NYSE:ING) but similarly valued. We will take a look at Infosys Limited (NYSE:INFY), Zoetis Inc (NYSE:ZTS), China Telecom Corporation Limited (NYSE:CHA), and Las Vegas Sands Corp. (NYSE:LVS). This group of stocks’ market caps are closest to ING’s market cap. As you can see these stocks had an average of 28.5 hedge funds with bullish positions and the average amount invested in these stocks was $1123 million. That figure was $507 million in ING’s case. Zoetis Inc (NYSE:ZTS) is the most popular stock in this table. On the other hand China Telecom Corporation Limited (NYSE:CHA) is the least popular one with only 8 bullish hedge fund positions. Compared to these stocks ING Groep N.V. (NYSE:ING) is even less popular than CHA. Our calculations showed that top 15 most popular stocks among hedge funds returned 19.7% through March 15th and outperformed the S&P 500 ETF (SPY) by 6.6 percentage points. The small number of hedge funds were also right about betting on ING, though not to the same extent, as the stock returned 18.1% and outperformed the market as well. Were Hedge Funds Right About Ecolab Inc. (ECL)? Were Hedge Funds Right About Dumping FedEx Corporation (FDX)? Were Hedge Funds Right About Getting Into Bank of Montreal (BMO)? Is Illinois Tool Works Inc. (ITW) A Good Stock To Buy? Is Vertex Pharmaceuticals Incorporated (VRTX) A Good Stock To Buy? Were Hedge Funds Right About Selling Northrop Grumman Corporation (NOC)?